On a Saturday night in April 1955 at the Jimenez dance hall, located on the north side of the overpass off of New Mexico State Road 104 in Tucumcari, New Mexico, a shooting took place. The bar brawl left innocent bystander, Mrs. Andrea Gutierrez, 53, dead and another, Jake Valverde, 21, wounded. This was my grandfather’s first homicide trial as District Judge. 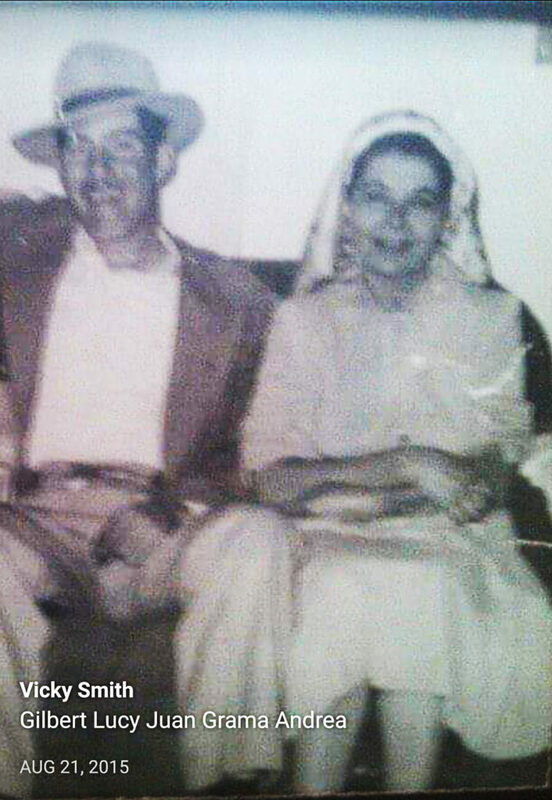 “It was during Easter Lent week and some friends from out of town came to visit and invited my Grandmother to the dance. She didn’t want to go to the dance on Holy week, but her out of town friends pleaded with her. When the fight broke out, she got on a bench not to get trampled and during the fight, a gun went off. She had been shot. She died instantly. The friends notified my Dad, who was at a drive in theater at the time. Valentino Rueben Ochoa was just 18 years old in1955. He had made the road trip to Tucumcari to go to a dance there on Saturday night. He was from Amarillo, Texas, about 120 miles east of Tucumcari. 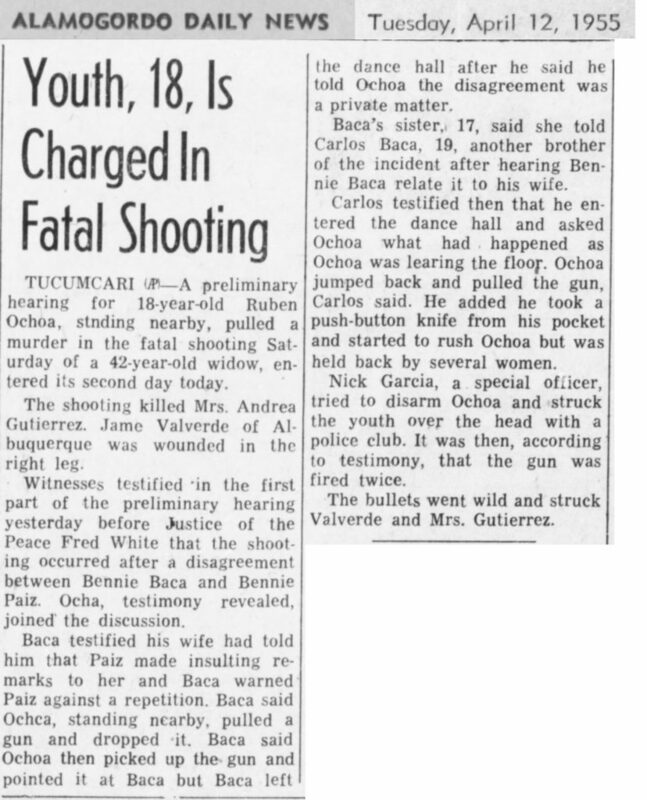 During the course of the night at the dance hall, Ochoa and a man by the name of Carlos Baca got into a fight. According to newspaper reports, police officer Nick Garcia saw a group of people gathering on the dance floor and went over to investigate. Ocha had pulled a gun and Garcia said he then pushed Ochoa back and Ochoa’s gun fired. Apparently Ochoa had aimed at Baca, fired and missed Baca but hit two bystanders. The shot that struck Mrs. Gutierrez severed an artery in her shoulder, causing her to bleed to death. Local Tucumcari attorney Manford Rainwater and Clement Calhoun of Amarillo represented Ochoa. The State’s case was conducted by District Attorney Victor Breen of Tucumcari and Assistant District Attorney, John Humphry of Fort Sumner. A principal argument for the defense was that Ochoa did not intend to kill Mrs. Gutierrez, therefore he could not be found guilty. When looking at this case, my grandfather notes a particular murder case, State vs. Carpio, that coincidentally took place at a dance hall back in 1919 in Grant county, New Mexico. Casamiro Lucero had been paying a little too much attention to Antonio Carpio’s sweetheart that night at the dance hall. 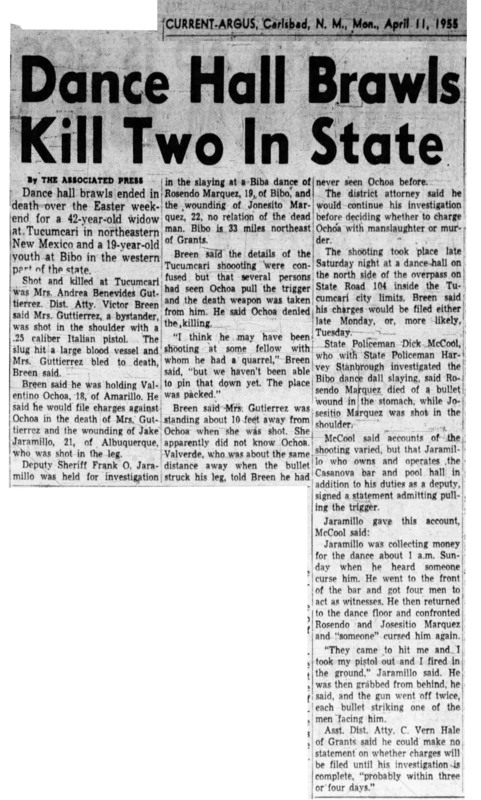 A jealous Carpio fired his gun, killing his friend, Efren Rios by accident, instead shooting the intended Casamiro Lucero. 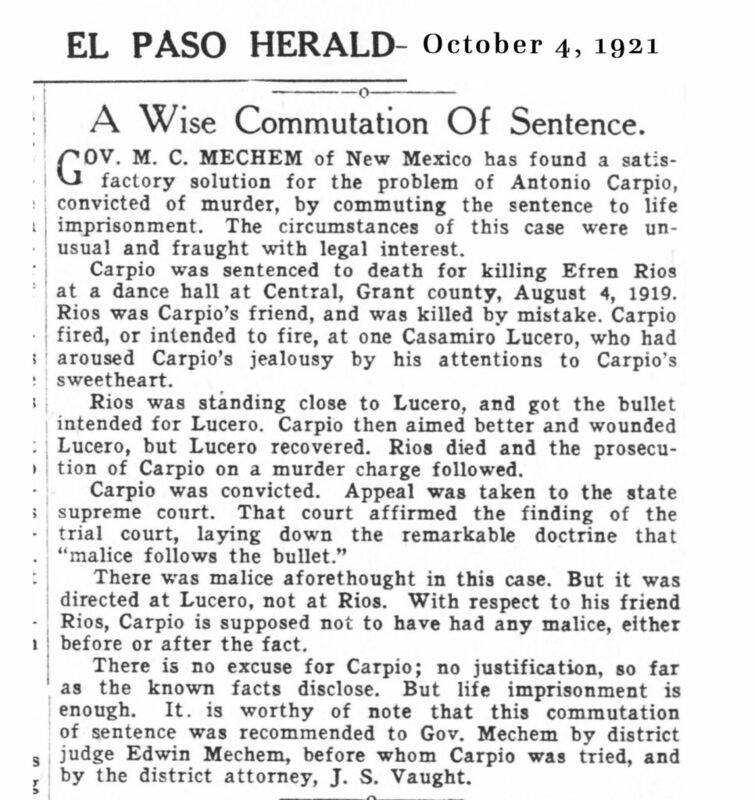 Carpio was found guilty and on appeal, the State court affirmed Carpio’s murder conviction, laying down the doctrine, “malice follows the bullet.” In 1921, Governor M. C. Mechem commuted Carpio’s death sentence to life imprisonment. As District Judge I tried my first homicide soon after I took the bench. 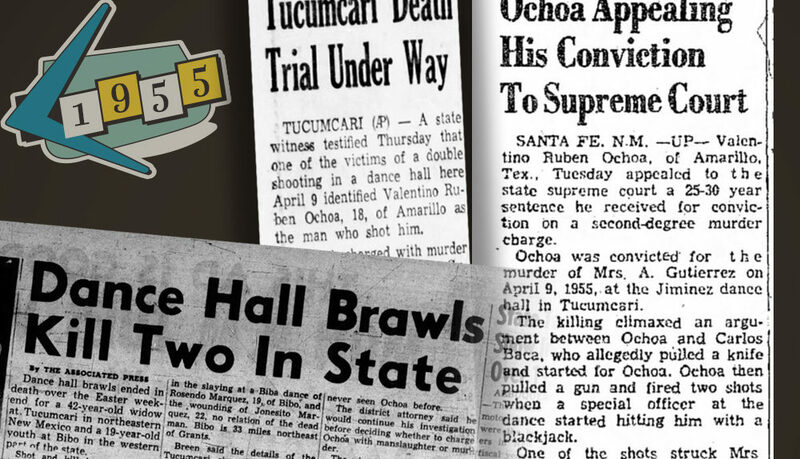 A young man, Valentino Rueben Ochoa and another man by the name of Baca got into a fight at a dance here in Tucumcari one evening. Ochoa pulled a gun, aimed it at Baca, fired and missed Baca but hit and killed an innocent bystander, Mrs. Gutierrez. While working on this case, I remembered another case, State vs. Carpio, that was decided by the Supreme Court of New Mexico, which held that in such a situation, where intent was not present to kill a particular person but the intent to kill someone else was present, that intent is transferred by laws to whoever he may kill. Simply put, “the intent follows the bullet.” Therefore the defendant has the same defense in the case as he would have had he killed the person he intended to kill. If the person he had intended to kill had attacked him then he would have the right to claim self defense. A plea of self defense in New Mexico is when someone attacks you and you fear bodily harm or you are attacked. You do not have to retreat; you can stand your ground, meet force with force and subdue or kill the assailant. I did a little more research Valentino Rueben Ochoa, as he was young man when he was convicted. He eventually got out of prison, not sure of the date though, had a family and made his home in Amarillo, Texas most of his life. From 1969, I did find a case, “Valentino Ruben Ochoa v. State Texas”, that was a state appeal on the possession of marijuana, which had a punishment of 5 years. After reading the document, it seems Ochoa was in the wrong place, with the wrong people, at the wrong time. The case describes an undercover narcotics agent, Dave Griffin, going to the Hong Kong Lounge in Amarillo, Texas dressed up as a “hippie” (yes, it actually says that) and sits with Ochoa, and some others who Griffin was familiar with, as he apparently didn’t know Ochoa. Griffin ordered and paid for the “lid” (what is referred to as the amount of marijuana it would take to fill a Prince Albert can). Later, Griffin left taking with him the remaining substance in a plastic bag and turned over to a fellow police officer. Valentino Ruben Ochoa, 67, of Amarillo died Friday, July 23, 2004.
with Pastor Pat Brown officiating. Burial will be in Llano Cemetery. He was preceded in death by his parents, Ramone and Maria Ochoa. and husband, Gilbert, of Pekin, Ill.; and nine grandchildren. What a terrible thing to happen. I am glad this story has not been forgotten.